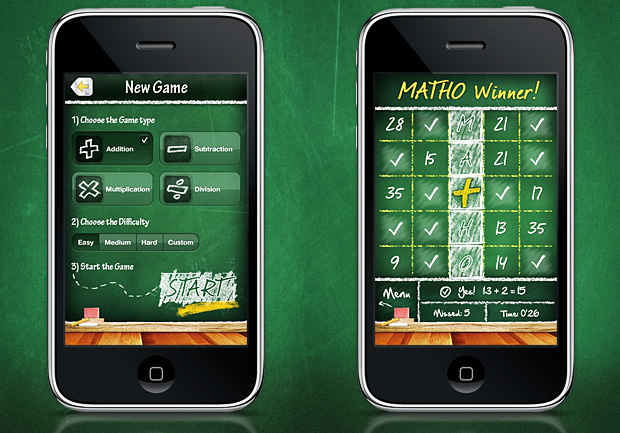 The player can choose game types of Addition, Subtraction, Multiplication or Division. The difficulty can be set to Easy, Medium, Hard and Custom. The Easy difficulty poses problems with values up to 8, Medium up to 12 and Hard up to 20. Custom difficulty allows the player to choose the maximum values for N1 and N2, and the resulting difficulty is the sum of these values. High scores are stored locally and globally. Local scores are the top 8 scores from games played on the player’s device. Global scores are submitted from all players around the world. View more images on Surgeworks website.